Synthetic Milk is an artistic scientific bench experiment that explores bioethics and innovation in biomedical research, humanity’s quest for immortality, and the potential for using bioprinting in tissue culture experiments - by using mammary cells from the artists/researcher’s body and immortal human cell lines to engineer large-scale, functioning, mammary tissue-structures capable of milk protein production. This project also looks at the mediation of the human female body, and the use of cells from the female body for profit without informed consent (e.g. HeLa cells). This project looks towards the future of biotechnological innovation, i.e., moving away from cells grown in simplistic, 2D environments, and toward 3D bioprinting methods to provide experimental models that more closely mimic tissue microenvironments in humans. This project combines Dr. Reid’s current scientific research with Ribeaux’s recent inquiries as an artist exploring the human body through synthetic biology. Using a 3D bioprinter created from scratch, Ribeaux and Reid will showcase new bioprinting techniques for mammary tissue engineering using human-based, collagen bio-inks. The ability to create fully-humanized, in vitro models represents a significant advancement for the field of tissue engineering. Design of the 3D bioprinting platform. (a) Adapted commercially available 3D printer. (b) Example of machine path during insertion routine. (c) Pulled-glass microneedle. Scale bar 1mm. (d) 24 well plate containing 3D bioprinted mammary epithelial organoids 14 days post-printing. (e) Bioprinted MCF- 12A organoids 7 days post-printing. Scale bar 500μm. Directed printing of non-linear organoids. (a) MCF-12A cells (40 cells per deposit) printed in a radial pattern with print spacings of (a) 500μm, 400μm, or 300μm. Images of cell clusters illustrate the ability to direct large scale mammary structures within 7 days using additional geometric configurations. (b) Fluorescent image of bioprinted, RFP MCF-12A cell clusters 14 days post-print demonstrating fusion of individual organoids into a contiguous circular organoid. (c) Brightfield image of large circular organoid 14 days post-print. (d) Example of a large circular organoid inside 24 well culture plate 24 days post-print measuring ~4mm in diameter. Scale bar 500μm. We have decided to bioprint these cells in the shape of a circle, an ouroboros, and a lemniscate (the infinity symbol) representing the inherent regenerative nature of the mammary cells, and humanity’s quest for the immortal. The terminal end buds of mammary cells grow in circular and spiraling movements, and have a cyclical nature and regenerative properties which are also referenced in the forms we are creating. This project also asks: What does it mean to truly be alive in our quest for the “immortal”? By using not only the artist’s cells, but also immortal cell lines from an anonymous, potentially deceased human donor to create tissue structures that can produce milk proteins by hormonal stimulation - have we then brought that human donor back to life, via their cells that are producing new structures and synthetic milk? It also represents humanity’s desire to conquer nature and the limitations therein - even as we grow immortal cell lines in vitro, they are unable to extend beyond this enclosed controlled environment. This artistic scientific bench experiment will be presented as a fixed mammary tissue structure for exhibition next to a two-channel video installation of mammary cells growing under the microscope, as well as the process of the bioprinter printing the cells. We can also bring a working bioprinter as a robotic bioart object. Bioprinting enables the formation of large mammary epithelial structures by directing cell-organoid 'self organization'. Day 1: Computer numerical control (CNC) processes direct the bioprinter to generate arrays of mammary epithelial cell-deposits inside a 3D scaffold. Following insertion, localized cell deposits 'self assemble' into mammary organoids. Individual organoids then 'self-organize' into larger structures according to the initial print geometry. While the mechanisms of this behavior are not fully understood, the resulting structures exhibit characteristic features and morphology of mammary epithelial tissue. These include: the formation of a tree-like structure with a central lumen, and bulbous structures at the tips of expanding outgrowths that exhibit rotational motion during elongation. 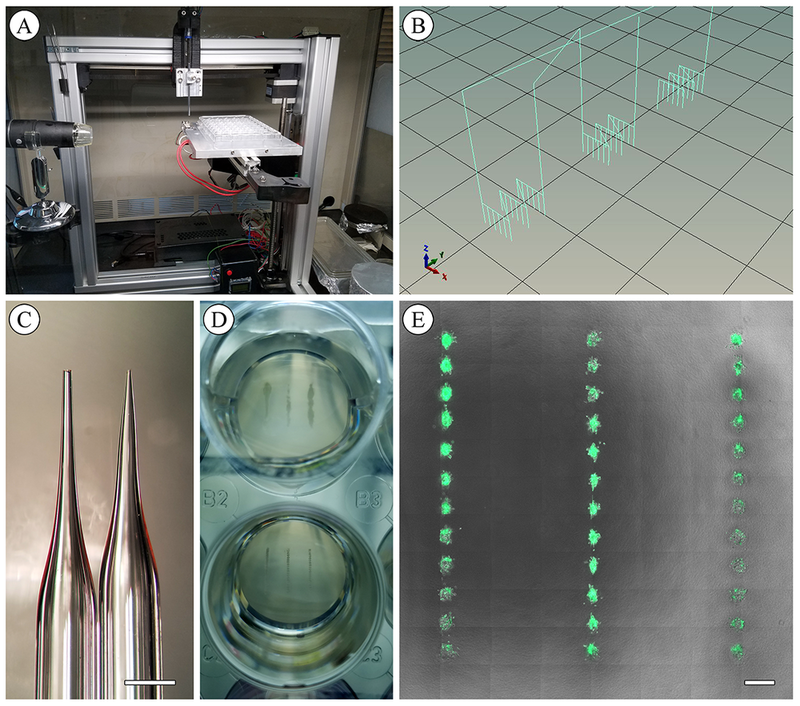 This data demonstrates the precision and repeatability of CNC processes to create in vitro tissue-analogs of human tissue as a viable alternative to animal models of human disease.